This will force a downgrade of systemd to 239.6-4, otherwise you will have a broken system as 239.3XX-X is NOT compiled against the new libidn2 package. 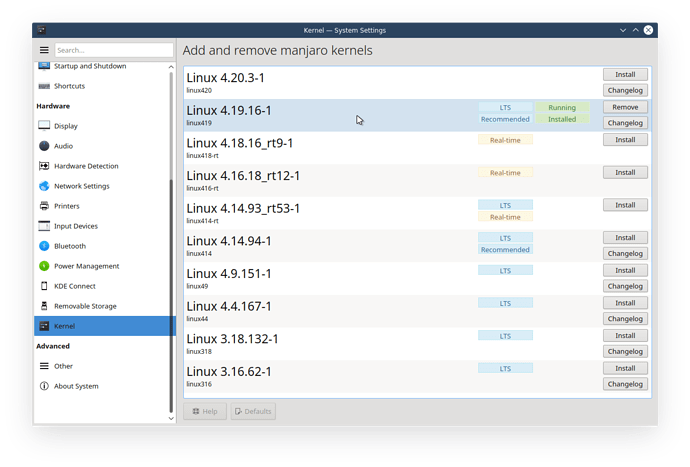 Manjaro has also dropped support for, and removed the packages of, the linux417, and linux418 kernels. It is highly recommended to use the mhwd kernel gui under system settings to install one of the recomended LTS kernels (linux414 or linux419) prior to running the update. The linux420 kernel is also available for use, however since this is not an LTS released kernel, you will face the same situation again in near the future. I got up this morning, powered up and logged in. Updates available, get them going and when they’re done reboot because it was a substantial number of packages and I didn’t have any work underway yet. System began shutdown but wouldn’t go into reboot and hung. Did a power reset and system can’t find a drive from the looks of things, drops me to a recovery root shell. Since updates are already underway on the second machine but I haven’t rebooted it yet I check the forums and found this, then couldn’t log in because it looks like the forum software has changed, so had to go through the email verification business first. Not a particularly good morning, and it’s not even a Monday. Any suggestions on how to recover my dead machine? After looking at the Netrunner home page I’ve decided to install the new 19.01 instead of recovering my Rolling machine that’s hosed. I know that Rolling will have all of the latest but not being a fan of Material Design at all I really like the idea of having a more colorful and vibrant desktop that’s described in the posting for 19.01. Besides, it’s probably about time to start fresh and remove all of the cruft that I’ve no doubt accumulated. I’m downloading the release via torrent and am replacing the latest Rolling iso that I’ve seeded to a 7.5 ratio. I just left it sharing indefinitely after downloading and I’ll do the same with 19.01 unless I need the space on my torrent USB stick. Since my second machine has already done the automated update but hasn’t been rebooted yet how do I avoid the problems? Do I just migrate to a different kernel as described? For my second machine I had already performed the automated update but hadn’t yet rebooted. So I ran the recommended upgrade command and when it was complete I used the Manjaro Kernel Manager to migrate to a recommended kernel. It successfully rebooted and is running fine from the looks of things. Thanks for the detailed posting on how to avoid the problem. When I move my fresh 19.01 install over to Rolling will I need to do these things too, or will they already be handled in the regular updates? The kernel isn’t the problem, but yes, I would use the kernel tool in system settings to install 4.19, you can always remove the older kernel later. The only issue with those kernels is you would no longer recieve updates to them (aka security or otherwise). Now with that said, all that is needed is to downgrade systemd as described in the notice. However, for convenience sake, before you reboot, make sure to open a terminal (Yakuake via F12 or konsole) and enter: sudo pacman -Syuu make sure to answer Y (yes) to the prompt. this will downgrade systemd and rebuilt the initramfs. For the non-booting system you can use the live media to chroot and then run the command as above. For a new install of Rolling 2018.08 will the downgrade also be required? Should a new iso be put up if this is the case? Otherwise a new Rolling user will get hosed as soon as they do their first update unless they’re on top of things right from the start. I’m currently re-downloading the Rolling iso as I was planning to go back to that after trying the 19.01 release. Rolling 2018.08 should include the Netrunner Black theme if it’s up to date, is this correct? So basically I could try it out without installing 19.01? I’ll follow your suggestion for recovering my Rolling box. I still might do a reinstall though just to clear cruft, but I’m always surprised after doing that just how much I’ve tweaked my system over time and how much work it is to get it back there afterwards. Good question, I don’t remember which version of systemd was available at the time I made the ISO. But for reference: if systemd is at version 239.X or lower then no, a normal update should be fine. However, if systemd is at version 239.3XX or higher then yes, a downgrade is necessary. Update: I forgot about the txt file that’s generated when the ISO is generated, that lists all packages used on the ISO. After looking at that list, the ISO was shipped with systemd 239.0-1, so from fresh install of the ISO, a normal update is all that is required. The downgrade only applies to installed systems that had been updated previously to 239.3xx and never downgraded as recommended. It’s a long messy issue, however when 239.3xx came out many users reported issues with it, so a downgrade was issued at that time for those that had the issues. With this update Manjaro decided to just completely dump 239.3xx and stick with the single digit revisions (239.X), hence the downgrade notice. I tried to find the Look and Feel Theme “Netrunner Black” on my machine that successfully updated Rolling this morning but was unsuccessful because it wasn’t present, although the “Netrunner Rolling” version is there from 18.08 (with the nice 3D graphic on the desktop). It doesn’t seem to be available when I search using the Get New Themes dialog box either. How can I get “Netrunner Black” installed on Rolling? Netrunner Black as seen on the latest debian ISO is a recent theme that hasn’t been packaged for Rolling yet, but might be included with next version of Rolling. For now it’s a netrunner only theme, since it also uses Kvantum which is not part of KDE default, that’s why it’s not available in the get new themes dialog. Manjaro just changed the package version once again, now it’s 239.303+really+239.6-1. What a mess, hopefully this fixes the issue all the way around. Personally, I would of just used an epoch to force a downgrade on the affected systems in the first place, but hey what do I know, LOL. Hi. When will the next iso of the Rolling version be available? With Plasma 5.15 and kernel 4.19? With all these latest bugs fixed. To make a new clean installation. I sure would like to know this as well. This has been disconcerting. I thought Linux was immune to this sort of thing. Sounds like another operating system. Under Linux Mint you can set preferences for updates for which updates are automatically selected, which are visible but not selected, etc, so you can pass on updates that could bork the system, as we have seen. That clearly would be a good idea here. In the big long list of updates one is tempted to trust it and go ahead with it, with everything selected, with potentially drastic consequences. I liked the idea of having the latest kernel but now it doesn’t seem like a good idea. Got some work to do. The issue with systemd has already been addressed (fixed) in the repository. Netrunner Rolling like it’s Manjaro base is by definition, rolling, there is really never a need to reinstall. With that said, Manjaro does not keep any of the non-lts kernels in their repositories for very long past their end-of-life date. Personally, I usually suggest having at least one LTS kernel installed on the system as a fallback. You can always change the kernel series your using, anytime you wish with the provided kernel tool under system settings. You can even have more than one series of kernel installed at a time, that’s the power of the Manjaro base.